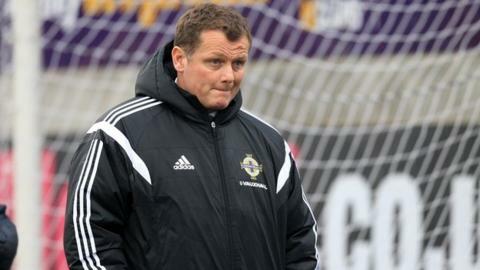 Northern Ireland Under-21s remain winless in their Euro 2017 qualifying campaign after losing 2-1 to Ukraine at Mourneview Park on Tuesday night. Jim Magilton's side have just one point to show from their first five matches. Shay McCartan gave the hosts the lead with a powerful long-range effort into the top corner in the 54th minute. Victor Kovalenko fired the equaliser into the bottom corner on 64 minutes and nine minutes later netted the winner with a volley on the run. Northern Ireland's only point of the series so far has come from a 1-1 draw with Iceland, while they have lost each of their other four fixtures by a one-goal margin. Senior international Luke McCullough captained the side but Ryan McLaughlin was missing after picking up two yellow cards during the campaign. Vladen Yurchenko had the first clear-cut chance of the game but his shot from distance flew just wide of Conor Brennan's post. Robbie McDaid was off-target with a shot for the home side, while McCartan went close with a header and Michael Duffy blazed over the bar. Before the interval, Yurchenko had a long-range effort saved by Brennan, who denied the same player just after half-time. Kovalenko flashed a drive over the bar, before McCartan broke the deadlock with an impressive finish after cutting inside onto his left foot. Kovalenko scored the decisive two goals and also had a shot cleared off the line, with McDaid also having an effort scrambled off the goal-line. With three minutes remaining, Cameron Dummigan saw his curling shot, which was bound for the top corner, well saved.